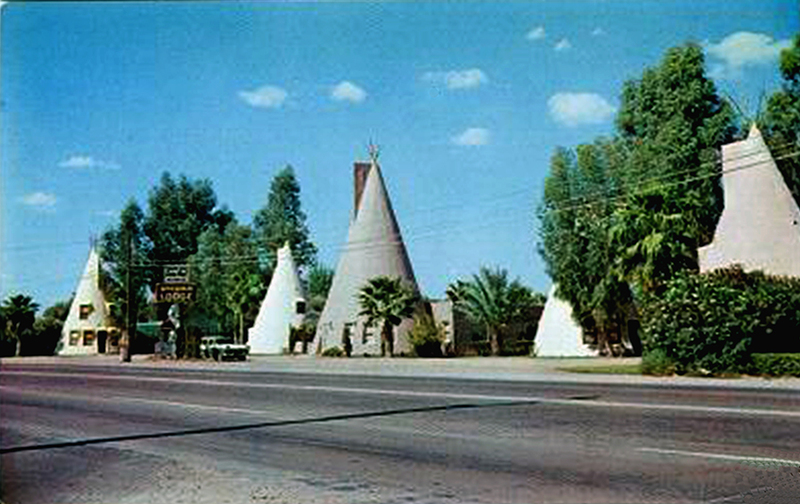 An early 1960s postcard of the Wigwam Auto Court, later called the Wigwam Lodge located at Apache Boulevard and McAllister. Courtesy of Tempe History Museum. A Pyramid and teepees. Not many cities can boast having both architectural styles in their communities. Tempe can. Virtually every local resident is familiar with our “inverted pyramid” on 5th Street inhabited by the city administration. How City Hall came to be built is a story in itself. But that is for another time. Today we are recollecting a nearly forgotten piece of Tempe’s past ─ what may have been in its day the town’s most distinctive architectural icon. Affectionately nicknamed the Tempe Teepees, it was officially the Wigwam Auto Court and later the Wigwam Lodge. Never mind the historical inconsistencies ─ that wigwams never looked like teepees. And even if they did indigenous cultures of Arizona never built such structures. That didn’t bother either Frank Redford of Horse Cave, Kentucky who patented his “Wigwam” design in 1936 or Maurice Barth (1896-1973) who built the oddities in Tempe. As America’s paved highway system grew in the twenties and thirties a new style of roadside architecture emerged ─ imaginative and sometimes outrageous buildings designed to attract the attention of travelers in their “fast- moving” automobiles. When the Federal Highway system was created in 1926, four national highways and State Route 93 converged in downtown Tempe on Mill Avenue and then traveled east on the Mesa Highway along East 13th Street ─ renamed Apache Boulevard in 1950. Relics of that wonderful era still dot the American countryside. Some even remain in Tempe as reminders of those early highway days. One that is unfortunately lost is the Wigwam Auto Court. Frank Redford was the father of the “Wigwam.” In fact he received a Design Patent for it. Redford was a lifelong collector of Native-American artifacts looking for a unique way to house and display his collection. His inspiration was a consequence of a visit to a Long Beach, California teepee-shaped drive-in. Returning to his home in Cave Horse, Kentucky, Redford applied for and was granted a patent for his unique “Wigwam” design in 1936. Between 1937 and 1939 Redford built several Wigwam Villages across the country ─ one of which apparently caught the attention of Maurice Barth who must have thought Tempe would be a fine place to build “Wigwams.” And so he did in 1945-1946. Tempe’s teepee’s actually predate by four or five years their better known still-standing cousins east of Holbrook. Barth was a member of a pioneer family that settled in St. Johns. We don’t really know why he came to Tempe. Located on the northeast corner of the present alignment of McAllister and Apache Boulevard, the teepees were ultimately doomed by ASU expansion. By the mid-1960’s the Wigwam Auto Court which had all the necessary tourist amenities ─ swimming pool, shuffleboard court and accommodations for travel trailers ─ was converted to apartments. Half of the diminutive, aging units were demolished in 1971. In 1982 ASU acquired the property. The remaining teepee’s saw their last occupants in 1983 when ASU bull-dozed an end to a special chapter of Tempe history. Many former ASU students and long-time Tempe residents have fond memories of the funky little teepees. If you are one of them, why not share your recollections by sending them to us? Maybe we will collect and put them into a future column.